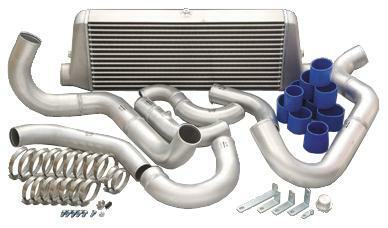 Each BLITZ Intercooler Kit is individually design for each vehicle produce maximum efficiency and performance. All BLITZ intercooler kits come complete with aluminum piping and all the necessary hardware. Intercoolers provide more power and reliability to any turbocharged vehicle. Intercoolers are heat exchangers, which are used to quickly cool down and dissipate the heat from the intake charge. During intense driving, the turbo compressor wheel super-heats. As a result, compressed air is forced through the turbochargers. Super-heated air reduces the density of the charge air, increasing the chance of detonation and reducing the power output of the vehicle. BLITZ intercoolers are designed to give maximum cooling capacity while allowing for minimal pressure drop. This is especially important if boost pressure is being raised, greatly reducing the chance of detonation. BLITZ intercoolers has the been known as the most efficient intercooler with a pressure drop of .05kg/cm2 at 1.2kg/cm2 of boost. BLITZ intercoolers are designed to flow considerably more amount of air than the stock intercooler by consistently and rapidly drawing away heat. With its tube and fin design a much greater cooling effect is achieved. A cooler airflow intake means a more dense charge of air, which in turn creates more horsepower. This reduces thermal stress to the turbocharger components and produces gains throughout the power hand.